More homeowners are selling properties for a profit based on the buoyant housing market conditions over the past few years, according to new data from CoreLogic. In the first three months of 2017, 96.3% of all homes resold did so at a gross profit compared to their previous sale price, according to the CoreLogic March quarter Pain and Gain report. Owners pocketed a median gain of $167,000 per sale, with almost $4 billion in profits realised nationwide. Meanwhile, the number of properties resold at a gross loss dropped from 4.2% to just 3.7% compared to the previous three months. CoreLogic head of research Nick Goodall says strong, long term growth in national values is behind the reduction in properties reselling at a loss. However, he noted the picture was more uneven at a regional level with some areas performing better than others. 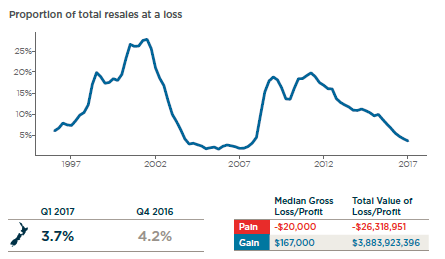 “The key point is the percentage of properties reselling at a loss is low, and continues to drop across the board. As prices increase, it becomes less likely a property will sell at a loss. “But the market is not delivering the same gains for everyone, with some regions as well as apartment owners and property investors more likely to face a loss with resales,” Goodall says. Of the main centres, Christchurch had the highest proportion of properties resold at a loss in the first three months of the year at 7.9%, a slight increase from 6.9% in the previous quarter. Dunedin had the second highest proportion of resale losses (2.7%), followed by Tauranga (2.5%), Auckland and Wellington (1.3%) and Hamilton (0.6%). Outside the main urban areas, regions which performed strongest included Kapiti and Masterton, with just 0.8% and 0.6% of resales incurring a gross loss respectively. Parts of the Waikato region also had very low proportions of losses, due to their proximity to the Auckland and Tauranga markets. Overall, owner occupiers were much less likely to take a hit on resales than investors in the first three months of the year (2.9% compared to 4.7%). Exceptions included Hamilton, Tauranga and Dunedin where there was little difference in loss-making resales between the two market segments. “Our analysis indicates investors occupy a riskier position in the market compared to owner occupiers, mainly due to the types of properties they buy and the parts of New Zealand they’re active in,” Goodall says. The report also found stand-alone houses were more likely to deliver profits than apartments in the first three months of the year, with just 3.4% of houses reselling at a loss compared to 7.4% of apartment resales. Download the new Pain and Gain report here.